The Bullwinkle Effect | Name-Brand Ketchup. 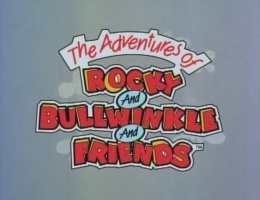 In the world of comedy, there is a phenomenon many call “The Bullwinkle Effect.” This is when a youngster watching the animated mishaps of Bullwinkle and Rocky sees only a lighthearted adventure story; but an adult watching the same cartoon picks up on all the satirical elements to the writing, and enjoys it on a whole other level. “The Bullwinkle Effect”: entertainment ostensibly designed for youngsters, but delightful for all ages. Children will enjoy it, but they will miss many of the references and jokes that amuse adults. “The Bullwinkle Effect”: it’s funny at five, really funny at fifteen, hilarious at twenty-five, etc. It’s extremely validating when not just one, but several sources have beqeathed a name upon something I’ve known all along. “I am so S-M-R-T,” as Homer J. Simpson would brag.